Featured Maybe Revelation doesn't belong in canonized Scripture? Discussion in 'Christian Scriptures' started by usexpat97, Feb 26, 2019. At the Council of Nicea, I understand there was much debate as to whether to include Revelation in the canon. Well...maybe it shouldn't have been. Very simple reason: because John wasn't talking to us. He was talking to the persecuted church in the Roman Empire. So he wrote in cryptic text so as not to be read by the wrong audience and misconstrued as a movement to overthrow the emperor. Now today, as a result, we have all kinds of theories about Milleniums, grasshoppers, horns, and helicopters that were never intended--because we, too, are the wrong audience. We do have a modern underground church, but they still wouldn't understand John's allegorical message because it was not directed at them. It's like your secret message you can communicate with your wife in large social gatherings. Only she would get it. So if you are not her, don't even try. Granted, Paul wasn't talking to us, either, to the Galatians, Ephesians, and Corinthians. But the difference is, he doesn't mind an unintended audience reading his letters. So he spoke openly. John did not speak openly. Finally, if you remove Revelation from the canon, that in no way impacts whether John's letter is the inerrant word of God. We just don't KNOW it is anymore, because we believe that is the Bible, and Revelation would no longer be part of the Bible. Revelation could still be from God and inerrant--just not God's inerrant word TO US. I submit this for peer review. I absolutely agree that there's a lot of confusion due to the cryptic writing style - and the misunderstanding as to context and audience - but that also happens with most of the Gospel writings as well. Instead of eliminating Revelation from the recognized canonized books - I think it's more helpful to just keep it in context (because there's a lot of hope that can come from seeing prophetic writing being fulfilled). There is plenty in Revelation which can help us to love the way God wants. So, this is to us. Yes, Jesus did have a way of communicating with His disciples so only certain ones would understand > like how He dipped the sop so Peter and John could know Judas was the one who would betray Jesus. My opinion is that John had no reason to worry about what people would think. He was talking about times yet to come, while also dealing with churches of that time. But prophesy has more than once . . . I understand . . . had reference to current time plus later times. So, things he wrote could have been for that present time, but also for us. There is plenty in the church messages which we all need to feed on. And the overall meaning of Revelation is applicable to us, no matter which times certain prophecies are talking about. Every bit of scripture can be somehow used to help us know how to love. My humble opinion is that "new babes" that have just come to Christ should read thru the NT a number of times first, then start on the OT, and after that, then start studying on Revelation and perhaps learning the Greek. I find this person's view concerning the "allusions" found in the book of Revelation that are found in the Old Testament rather fascinating. The mark of the beast. Armageddon. The Four Horsemen. The false prophet. Babylon the great. Falling stars, stinging locusts, and giant hailstones. The seven last plagues. The bottomless pit. The lake of fire. These images of terror and catastrophe from the book of Revelation have greatly influenced the thinking of millions of Christians through the ages. Even the secular press uses images such as "Armageddon" and "four horsemen of the Apocalypse" to describe calamities in our world. Despite 1900 years of fascination with the book of Revelation, John’s letter to the seven Churches of Asia continues to be misunderstood. And badly misinterpreted! One misconception shared by some is that the Revelation has nothing of importance to say to us. It’s considered to be merely a bizarre piece of first-century writing with no relevance for today. Another wrong idea is that the Revelation is a code book describing a specific outline of history written in advance. Countless interpreters have tried to "decode" the book from a historical perspective to find all the major world events of the past 1900 years. Others interpret it more literally as a handbook for predicting the cataclysmic events that will bring the final wrath of God and the end of the world. Through the years I have ministered the Word in Bible studies, seminars, and church services of various types. When there has been a question and answer session, or when opportunity was granted for people to request teaching along a particular line, the most often requested subject has been — THE BOOK OF REVELATION! The book of Revelation is THE REVELATION OF JESUS CHRIST. Revelation is a book that teaches who and what Jesus Christ is. It reveals Him in all of His glory, unveils Him in all of His fullness. You will find Jesus the Christ in every chapter of the book, for it is the revelation of Himself. The book of Revelation is the Sixth Gospel of Jesus Christ. Matthew, Mark, Luke and John wrote what they saw of Jesus Christ on the earth in the days of His flesh. Luke, in the book of Acts, wrote of the revelation of Jesus that came by the Holy Spirit on the day of Pentecost and throughout the in-part realm of the earnest of the Spirit during the church age. How do you know this difference between Paul and John, that Paul accounted for an unintended audience and John didn't? Can you offer more than conjecture about this? Who knows how many correspondences circulated between and among churches in the first century. Thousands, no doubt, Paul's being among them. All addressed to specific audiences. I would hazard that we misunderstand Paul's intentions as much as we misunderstand John's. But like any of Paul's letters, Revelation is somewhat decipherable when read in context. It tells us what the Church is. It describes the end of Christ's journey between the veils. It parallels the First Jewish War - the 3½-year exile of the Church from Jerusalem, the 5-month siege on the temple, the descending of the Church onto the earth again in unencumbered splendor. Whatever the verbiage - however creatively penned - it illustrates essentially the same thing that Paul's letters do: the transition from old to new. The New Testament is about the new creation - or the kingdom - that Christ delivered. The Gospels and the epistles relate that narrative, including Revelation. The assumes a preterist interpretation of Revelation. It's very possible that this interpretation is wrong. This would suggest we should also throw out all other apocalyptic literature in the Bible like Daniel, much of the minor prophets, and Ezekiel because they also use symbolic and cryptic language. This assumes that because the language is symbolic, impressionistic, and cryptic that it cannot be understood. This forgets that there are two authors of Revelation. John and the Holy Spirit. Even if John did not have us in mind when he wrote the book, the Holy Spirit certainly did. Every word of the Holy Spirit remains useful for the church and the church needs to hear it and apply it. 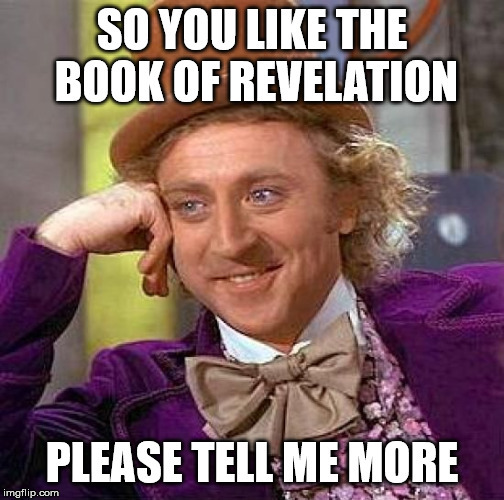 I agree that Revelation is a difficult book to interpret and apply. But I also believe, after teaching on this book for several months, that it is very understandable and applicable to Christians today and we need to hear its message. 1This is the revelation of Jesus Christ, which God gave Him to show His servants what must soon come to pass. He made it known by sending His angel to His servant John, 2 who testifies to everything he saw. This is the word of God and the testimony of Jesus Christ. What is your and others view of the book of Enoch? Love the music!!! Beautiful. and great vid!! Song Xibalba (feat. Kronos Quartet) Artist Clint Mansell from the movie "The Fountain"
Zech 4:7 Who are you, great mountain? Before Zerubbabel you are a plain; and he will bring out the capstone with shouts of 'Grace, grace, to it!'" That brings light to a lot of Bible scriptures. Yahweh actually speaks to the mountains in the Bible. Numerous miracles and heavenly events transpired on some of the mountings in Israel. “Here is the mind which has wisdom: The seven heads are seven mountains on which the woman sits. It is fascinating how the human mind seems to automatically search for patterns --- in geological features, in clouds, in tea leaves, etc. And when we look for patterns, be it consciously or unconsciously, we will find patterns. Now read the bible and search for patterns between Enoch & Genesis and crypto-archeology. Enoch is not in the Bible. It is unBiblical, non Canonical. Enoch most certainly IS in the Bible... his book is not part of the canon, however. It would be more accurate to say the book claimed to be written by Enoch. Hello. I read thru it just once back in about 2006 and was interested in this 10 week prophecy. Here is a discussion thread on it for those interested. The 10 weeks of Enoch, inspired or not? Although the book of Enoch falls outside the current canon of scripture, it is an important book that tells us a lot about the important beliefs of the early church and the Jews of that time. It has been included in the canon at times in the past and was clearly a very important book to the early Messianic believers and was usually found bound together with the Gospels and Epistles of the Early church. Many copies were found at Qumran. The authorship of the book is contested because its style changes several times through its text which would indicate more that one writer. This may be in part due to the fact that many of the early works of Judaism were preserved through an oral tradition and later put into written form. I am not a biblical scholar and have no basis to prove this, so it is then my opinion that this is the case. But the fact remains that it is without a doubt a pre- Christian writing by as much as a 200 years and was accepted by the early church as a work handed down from Enoch. The accuracy of the prophetic writings in it speak for themselves. Many copies of Enoch was found among the Dead Sea Scrolls which date to at least 160 BCE. A man shall be elected as the plant of righteous Judgement. Visions of the holy and righteous shall be seen. And the race of the chosen root shall be dispersed. and many shall be it’s deeds, And all it’s deed shall be apostate. And the sinners shall be delivered into the hands of the righteous. And all the works of the godless shall vanish from all the earth. He will execute vengeance amongst the angels. and a new heaven shall appear, and all the powers of the heavens shall give sevenfold light. 17. And after that there will be many weeks without number forever. is an ancient Jewish religious work, ascribed by tradition to Enoch, the great-grandfather of Noah. Enoch warrants special attention for the unique material it holds, such as the origins of supernatural demons and giants, why some angels fell from heaven, details explaining why the Great Flood was morally necessary, and prophetic exposition of the thousand-year reign of the Messiah. It is not part of the biblical canon as used by Jews, apart from Beta Israel. Most Christian denominations and traditions may accept the Books of Enoch as having some historical or theological interest, but they generally regard the Books of Enoch as noncanonical or noninspired. I praise God almighty for giving me a second chance to be alive after a stroke last year November which I spend 5months and 3weeks in the hospital I'm still recovering but every day I ask FATHER GOD almighty to forgive me and send his holy spirit to guide me teach me every day . Im listening to Enoch for the first time in my life and I Cry as I wait in traffic( truly a blessing in disguise) of how we've been robbed from this truth. I'm a sinner in capital letters and hope God will have mercy on my soul as I awaken to this false reality that we've been subject to from day 1! Lord Jesus Christ, son of God, have mercy on me. I sinner! FWIW, the Armenian Church did not accept Revelation until the 1700's. Good insight about Enoch. Why is Revelation in and Enoch is out? That last part is interesting: prophets and righteous people. Jesus could be referring to false prophets and Pharisees, but He could also be referring to those who truly are right with Him. The disciples got to witness plenty of stuff we never will. But we get to have the New Testament, concordances, online search, Travelocity.com, and they don't. Maybe we long to know what's to come in the future--particularly right before Christ's return--but that is not to be. And we shouldn't fool ourselves into thinking Revelation is that, when maybe it isn't? The problem ls with understanding it and why that is difficult, we are told in Isaiah 29:9-12, Jeremiah 4:22, Isaiah 8:16, Isaiah 42:18-20, Matthew 13:14, Romans 11:8, 1 Corinthians 3:18 and many others that tell us how people will be blinded to the truths because they have chosen to believe false teachings. Revelation is the only Book that gives us the correct sequence of the end times events. It fits with all the other Bible prophesies which are 'a little here, a little there', but can be sorted out into a coherent picture with the help of Revelation. Surely that is enough for people to do their best to have their names Written into the Book of Life! Okay, Revelation does explicitly say it talks about events yet to come. A preterist can still say it happened not long after its writing. I never thought the events of Revelation to be in sequence. Particularly the war in Heaven, angels falling, all that. That seems historicist. Labelling theories like 'historicist', is fraught with anomalies. Myself, I read the Prophetic Word and using the hindsight of the passing of nearly 2000 years since Jesus came, plus modern knowledge of the world situation and of natural events; then the Revelation story is plausible and from the point of view of the Creator God, a very probable scenario. We Christians should know all about it, what God has planned, all throughout our Bibles and Revelation caps it all with the final outcome of an Eternity with God for all who prove their worth and have their names Written in the Book of Life. Nothing in current events can tell us whether there is war in Heaven. Revelation 12:1-6 strongly suggests Jesus. Then verse 7 has a war in Heaven, Satan and his angels cast down; sequenced well after Jesus has ascended. Which doesn't add up with the serpent in the Garden of Eden and demons being cast out in the Gospels. Can't have Jesus casting out demons if they remain angels until after he ascends. At the Council of Nicea, I understand there was much debate as to whether to include Revelation in the canon. Well...maybe it shouldn't have been. First of all Books to be cannon were not widely discussed and no cannons regarding this were passed at Nicea. The main discussion was one over Logos IE: whether Jesus was of the same Substance as God. IE whether they were always one. All the books Arius had used to defend the position of his separate substance were banned. Possession of the banned books was a death sentence. Enoch was one of the books that got caught up in this matter. While not actually having anything to do with Logos, it was a book often referenced by Believers in this view of the Godhead. Many Gnostics believed that the Arch Angel Raphael was Jesus. Many Others belied it Was Michael... which is what is believed by the Seventh Day Adventist today. It is important to note this was not Trinity that was being formalized but rather duality, Trinity came later. It should also be noted that while some Christian groups state that there was unanimity in this belief that is not true. 112 Bishops wrote to Constantine after saying that they had felt pressure to sign when the did not agree. Just 20 years later a synod of over 300 Bishops passed a cannon saying that Jesus was not of the same Substance and therefore Subordinate to God. This was the main battle of the fourth century and by Battle I mean Battle, not ideological argument. Supporters of the two various views murdered each other in the streets and even in the Churches. Bishops were dragged from their Churches and killed in the streets. Athananias was convicted by over 300 Bishops of murdering Arius by poisoning. A War between two Sons of Constantine was fought over this very ideology, a war in which tens if not hundreds of thousands died. A war which determined which Doctrine came down through the centuries. The Books that could be considered cannon was later in the century, formally laid out by Athananias 367, in a letter to the other Bishops. Enoch was excluded as it could not be agreed upon. You have to understand this was a fight over creating a Catholic which is Latin for Universal Church. Everything was boiled down to a common belief and if it could not be agreed upon by a majority it was put aside. The Western Bishops which had been the Main Supporters of Same Substance view of Logos did not want Enoch made Cannon as mentioned above. They wanted to wipe out all books that even hinted at something other than their Belief. In 387 AD they burned alive Bishop Priscillian and four priests for refusing to burn Enoch and other books and refusing to say Jesus was of same Substance. In my opinion this makes the beginning of the Longest Ideological persecution in the history of Man. From here on in if you didn't believe as the Universal Church did you would be Tortured and branded a heretic by the Church, which more often than not meant you were put to death by the civil authorities. It was never the Church that killed you it was the Church that passed judgement it was the civil authorities that killed you. The book of Revelation is exactly where God intended it to be. Not only read it, but understand it. It is there for a very important reason. Despite the apologetic efforts of those seeking to rehabilitate this document for the modern mind, it is difficult to see Revelation as anything more than a paroxysm of hate created by a mind bordering on the psychotic. The early church long resisted placing it in the developing canon of inspired writings. John the prophet has cast his spiritual Christ in his own joyless and vengeful image. The voice of this Messiah is his own, ready to punish for every slight, every rejection the prophet has suffered in his missionary work. I have to go with JustTheFacts' insights. A lot of material to chew on, which impacts not just Revelation but apologetics. At the Council of Nicea, I understand there was much debate as to whether to include Revelation in the canon. What made them decide to accept it?